The Rat Terrier is a multipurpose companion dog that is capable of hunting rodents and vermin above and below ground as well as coursing small game. He is a sturdy, compact, small-to-medium sized parti-colored dog giving the appearance of elegance and athleticism. His short, smooth coat may come in any variation of pied patterning. Pied is described as comparatively large patches of one or more colors in combination with white. Acceptable colors, with or without “tan points”, include the predominate black, or chocolate, red, apricot, blue, fawn, tan, or lemon. An American breed, the Rat Terrier was created by immigrants using a mixture of crosses of old time Fox Terriers and other European Terriers common in the 19th century; the Old English White Terrier, Manchester Terrier, Bull Terrier, etc. 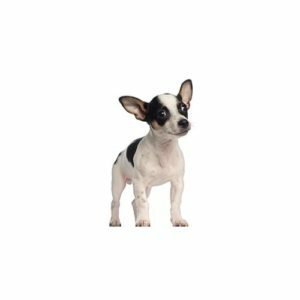 ; andlater more Smooth Fox Terrier, Beagle,Toy Fox Terriers, Whippets and Italian Greyhounds. From 1910 through the “dust bowl” era of the 1930s, the Rat Terrier was one of the most common farm dogs, used for ratting, hunting varmints and other work. This loyal, active and playful breedis at its best asamemberof itshumanfamily, but may be reserved with strangers. Intelligent and trainable, many Rat Terriers excel in Agility and Obedience, events which also serve as excellent exercise outlets. The breed sheds seasonally and requires brushing with a soft brush or rubber curry mitt. Miscellaneous class; Terrier group designation. Two sizes: Miniature – At least 10 inches tall at the shoulder, not to exceed 13 inches; Standard – over 13 inches,and up to and including 18 inches in height measured at the shoulder.Generally 10 to 25 pounds. Ratter; farm and companion dog. Are you interested in purchasing a Rat Terrier?